Dell Resume (3/V15H-WR) DELL LATITUDE / INSPIRON SERIES CMOS Battery. Type: Nickel Metal Hydride (Ni-MH). Voltage: 3.6V. Capacity: 15 mAh. Length of Flex: 45 mm. Height: 4 mm. Length: 35 mm. Width: 13 mm. Functional replacement for: Varta 3/V15H, Varta 3/V30H. 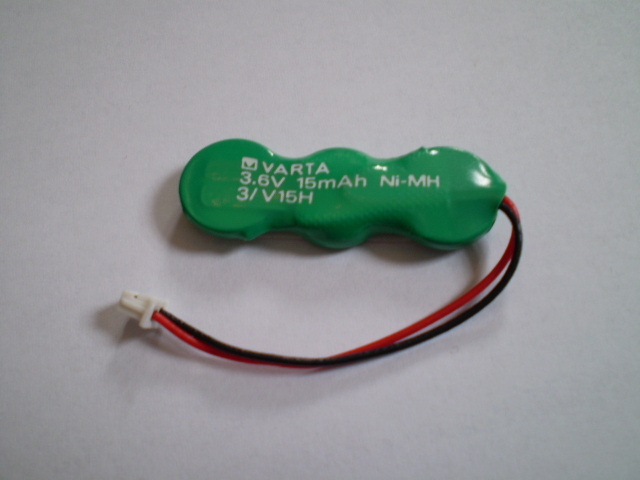 three Varta V15H NiMH cells in a row. shrink wrap marked "3.6V 15mAh Ni-MH, 3/V 15H".